I know we celebrated Thanksgiving back in November, but I think it’s important to recognize what you’re thankful for daily. This recipe reminds me of my thankfulness for Ryan. Though we love to drive each other crazy, I am thankful that he daily makes sacrifices-big and small-for me. A few weeks ago I threw this salad together on a busy weeknight. I was crabby. He was crabby. Though most evenings I’m happy to be preparing dinner, this particular night I was a little bitter that he wasn’t the one making it. There was useless bickering and a few unkind words, mostly from me, but despite my behavior and attitude, Ryan still went out of my way to tell me he really liked this salad. The next day, I sincerely apologized for the prior days behavior and he immediately forgave me with such kindness, I remembered just how blessed I was. Then we sat down to a dinner of the week’s leftovers and he graciously let me have the spicy chickpea salad, even though it was clear that it had been his top pick. The moral here? This salad is really good, and my husband is a gem! Though it has the word spicy in the title, I didn’t find it too spicy. 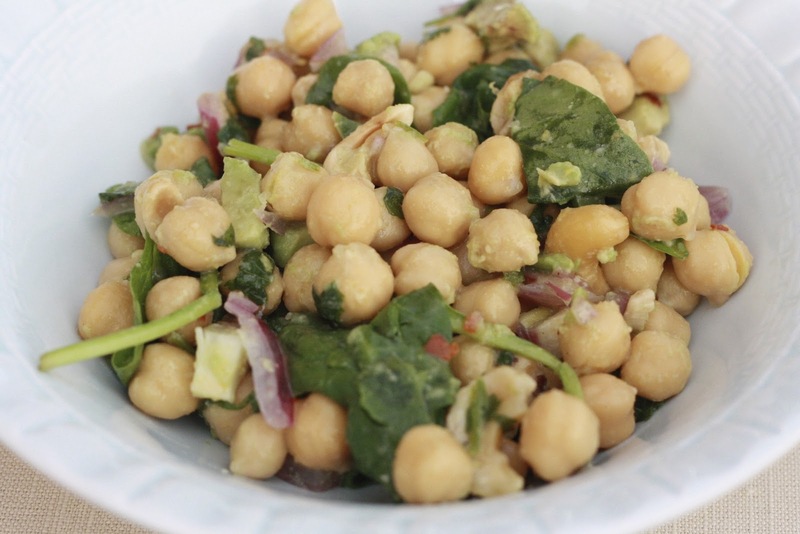 However, the dressing is incredibly flavorful and the addition of both avocado and salted cashews make for a great mix of tastes and textures. Because I’m always making new stuff for the blog, repeated meals in our household are few and far between. Ryan’s asked for this to be a repeated meal and for him, I think I can make that happen! 1. In a medium bowl, mash the garlic and salt until a paste forms. Add the mustard, honey, red wine vinegar, and red pepper flakes. Whisk together and while whisking, slowly drizzle in the olive oil until the mixture is thick and emulsified. Add salt and pepper to taste. 2. In a large bowl, add the chickpeas, onion, jalapeno, lemon zest, lemon juice, nuts, avocado, and parsley. 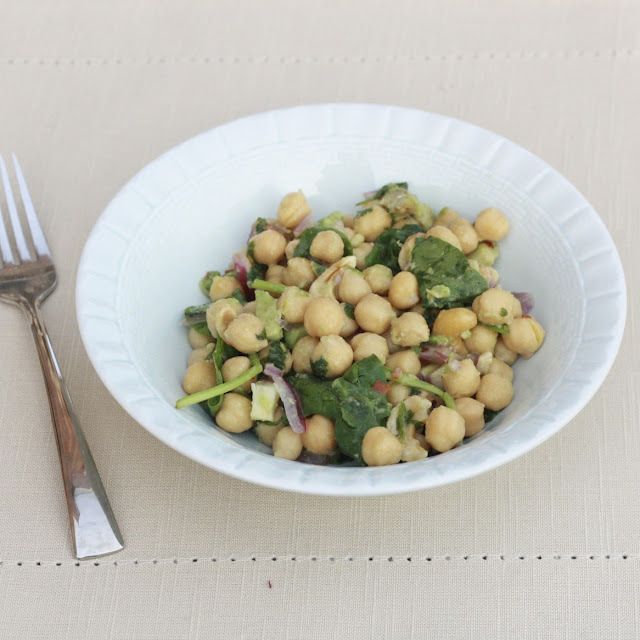 Toss the dressing with the chickpea mixture to combine well. Just before serving, add the spinach. Can be stored in the fridge for up to 3 days.